Venus Retrograde 2018 takes you to the forbidden side of love! 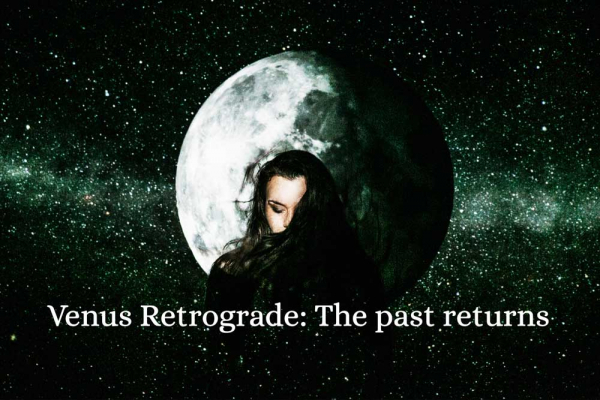 Venus goes retrograde in 2018 from October 5th to November 16th taking you to the dark side of love. Venus is the planet of love and relationships, money, luxury, pleasure, and everything that makes life beautiful. When Venus goes retrograde, there’s no more give. The things that make you happy - or are supposed to but don’t! - are put to the test. You have 40 days and 40 nights to re-evaluate your love life, finances and agreements, reassess your priorities and restore what is of central value to your happiness. Venus 2018 stations retrograde at 10 degrees Scorpio, then drops into Libra on November 1st going direct two weeks later at 25 Libra. Venus backtracks in that part of the zodiac every 8 years so think back: What was happening for you in autumn 2010? How about 2002? Venus in Scorpio could awaken your baser instincts. Old lovers return, illicit affairs call your name and temptations abound! You’ll have to be strong to resist the lure of the past, as well as any forbidden pleasures during this time. But it could also help you get the one thing you have always really wanted but never dared ask! Venus retrograde in Scorpio has the power to transform your life and correct any power imbalances. After November 1st, when Venus backtracks into Libra, you will be able to revisit your contracts and relationships from a new and more empowered vantage point. You’ll often find that Venus retrograde is a strange and memorable time. Marked by unusual affairs that stand out like a sore thumb (or sometimes, an oasis! ), it also brings meaningful encounters with the past while your present relationships go through an off period. This is a good time to rediscover an old passion or reconnect with an ex; but it’s no time to make major decisions, because your preferences, priorities, and financial judgment are flipped on their head. If you’re single, refrain from dating if you can. Take time to know your heart or seek closure with an ex before you re-enter the dating scene. This is also no time to make major investments, change your look or undergo cosmetic treatment. You’ll have plenty of time to rejoice in all your usual pleasures - and more, if you play your cards right - once Venus turns direct again and exits her shadow, after December 7th. Just in time for Christmas! While there are certain dos and don’ts to Venus retrograde (check out when Venus was retrograde last! ), her moonwalk through Scorpio and Libra will influence each zodiac sign in very different ways. Check out your horoscope! Do you find yourself facing a difficult romantic dilemma? Our expert love-psychics can see beyond the shadows: Dial 0207 111 6304 from the UK or 1877 608 3731 from the USA and get help now! It’s time to take a hard line to how you dish out your money and your love, dear Aries. Venus rules your finances, your self-worth and your relationships and you might find that others do not show their appreciation - financial or otherwise - for your wonderful self like they’re supposed to. This is a good opportunity to withdraw some of your dependency on others’ approval and re-evaluate your contracts and associations. If the trust is not mutual and the energy investment nor fair, you might decide to walk on. Or demand a recount! Give it till December to make a final decision. Venus is your ruler, dear Taurus, and her retrograde affects you more than most. You might find that you’re not in the mood for much, as all the things that used to give you pleasure - your romantic prospects, your work and even your personal whims - fail to excite you. You’re totally out of sync with others and - more importantly - with yourself! Lay low, seek closure with an ex and try to get to the bottom of what’s missing. Initially you might think that it’s someone else’s fault but you will soon discover that small changes on your part - your work, self-care and daily routine - can make a big difference! With Venus lost in the woods, you could find yourself neglecting your day to day duties and losing your appetite for work, dear Gemini. It’s as if you’ve lost that something that makes life fun along the way. Take a time out to restore that creative spark in all you do. Put fun back into your work and love back into your life! Stress could get the better of you if you keep pushing on, resulting in little physical troubles and annoyances. That’s just your body telling you that something’s not quite right. A work colleague could also behave strangely. It’s a clue! A sign to reconnect from the heart. Venus retrograde in Scorpio is sure to get your love juices flowing, dear Cancer! You’re tired of not getting what you want and, this time, you refuse to play nice. You’re willing to risk house and home and even test your friendships in your search for true love and happiness! You’re done with cheap substitutes. You’re ready to play with the big boys! If you dive in at the deep end, you’ll uncover your true love and creative passion. This will help you reassess your core priorities and decide on the foundations on which to build your empire. Oh, and if you suddenly get the urge to paint your living room bright pink, please hold off until December! Your mind is taking some strange turns, dear Virgo. People past make an appearance, causing you to wonder what could have been and making you insecure about your choices. You’re not in the mood for superficial interactions right now. And yet, you usual gang is nowhere to be seen. You’re in strange surroundings, doing unusual things and feeling like the odd one out. Get ready to see all things and people hitherto familiar to you in a new light! No matter how uncomfortable you feel, this new environment has a gift for you: it highlights assets you didn’t even know you had! This will help you reassess your priorities. Hold off any major decisions or purchases till December. Lock up your credit cards, Libra! This is not the time to be making a grand investment - and the same goes for your love life. Your heart is going down some strange paths. You’re wavering in your commitment and you won’t know whether your feelings are true or not until your ruler Venus is totally out of the woods in early December! Hold off breaking an engagement, throwing yourself into the arms of someone new or radically changing your appearance. If you’re pondering about an ex, use this time to test the waters and re-evaluate whether this chapter is done and dusted or whether it’s where true love is at. Ultimately, it’s your choice. Venus is retrograde in your sign, dear Scorpio, and it seems you’re faced with some tricky relationship dilemmas. Love has run into obstacles, someone is not fulfilling their side of the bargain and the situation requires expert handling on your part. You will have to win this one the old-fashioned way: by showing them what you’ve got! But it might take some time… Use it to reconsider your appearance, revamp your personal attitude and face your darkest demons. Set out to transform any areas of weakness and you will soon find yourself incredibly empowered. Be ready to unwrap a whole new you in time for Christmas! Have you lost touch with your hopes and dreams somewhere along the way, dear Capricorn? Do you wish you could reconnect with long lost friends? Chase long forgotten desires? An old dream is possible once more - so secret, fragile and forbidden you can scarcely speak its name. You better believe it! Dig it out. Take time to reassess it, reunite with friends that care and ditch those that don’t. See your world in a new light! Once you revive your dreams, it will be time to sift and filter your career and life direction through them. Plus, you never know whom you might meet along the way. Once your love, your heart and joy are unlocked, anything is possible! What’s your legacy, dear Aquarius? Do your name and reputation reflect your true potential? Your core values? You’ve been having reservations about how you’ve set up your life for a while so stop pushing forward and take stock of where you’re headed. Choose those goals and directions that are truly meaningful to you. Doing so will give you a much more inspiring vision, not to mention a sturdy foundation to build upon, knowing you’re being true to your heart. Once you realign your inner compass, it will be time to revise your slogan to fit your new public image and goals. By Christmas, you will be setting sail for new shores! You’re really not in the mood for expansive notions, Pisces - not until you’ve rooted out what bugs you up close and personal. Your visions have gone stale and nothing inspires. You might blame it on the gloomy weather or on the end of the holiday season but these roots go deeper. It’s your closest relationships that are coming up for a serious reassessment. Whom do you place your trust in? Do you expect others to do for you what you can do for yourself? Do you not receive the love and appreciation you deserve? Once you reposition yourself - emotionally and financially - you’ll find that the world is full of colour once more - just in time to appreciate the Christmas lights!